The back cover says: Would you fall in love again??? How would you react if someone you love suddenly calls you to convey message of her engagement and moves out of your life? Even the last thread of hope tears up and they are apart. Priety is gone and HE remains a mere spectator watching the tide of the time rising high against and shattering all his dreams. Will he be able to fight out this hard situation?? Will he opt for self-destruction, making his life hell???? Will he ever take a chance of searching for love again???????? An exquisite beauty slowly and steadily moves into his life and there begins emotional battle between present and beautiful past. Will he be able to replace Past with desired Present???? What if the same thing happens again???? 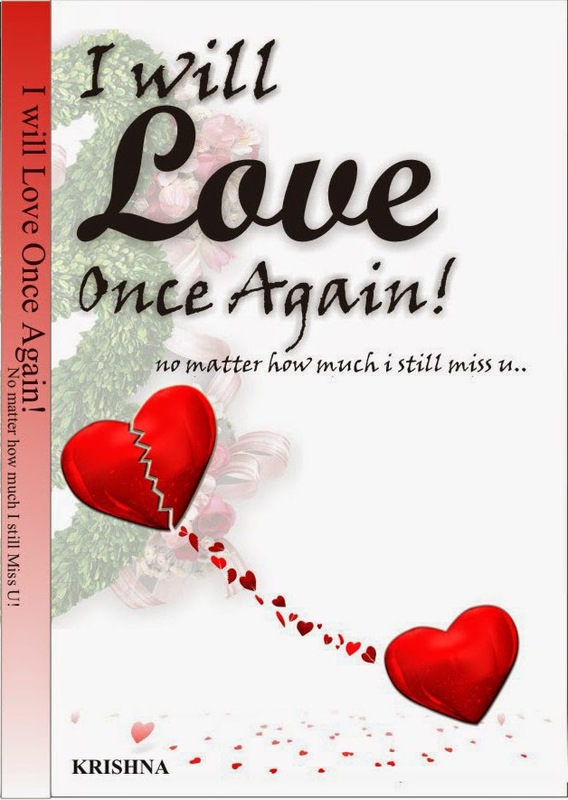 Read and get to know how HE narrates ‘I will Love Once Again’. The name is perfect for the book. Especially the bottom line ‘no matter how much I still miss u’ absolutely supports the content of the book which unfolds around the main protagonist continuously missing his past. The cover looks simple. A broken heart is in the process of filling its voids. I loved the font used in the cover. But I think the cover will fail to catch readers’ eyes with this simple design. It could have been designed in a better way. The author have a commanding grip on the language. The story is narrated in direct narrating style and the way the author had managed to cope up with this style is praiseworthy. The author has very efficiently narrated the whole story without disclosing the name of the main protagonist, which is very much new to me and I think to the readers too. Readers are going to love the distribution of the chapters. But the main flaw of the narrating style is, the author fails to keep up the speed of the book. At times I felt the tempo of the book dropping. The story evolves around the main protagonist struggling in the recession and trying to find a job in the corporate world. Priety (the female protagonist) walks out of HIS life to marry the guy her parents have chosen. The story grows with the male protagonist moving to a new city in a new job with new friends and in search of new love. But each time he finds a new girl to try on, he ends up comparing her with her past love Priety. I loved the way the author has scripted those flashbacks. The author will make readers glued from the very first page but at times I feel the story a bit exaggerated. As I was nearing the end the book was becoming predictable. But I must say few chapters were so interesting that I couldn't put down the book. +Point: The way the author narrated the whole story is like he is conversing with his readers. -Point: Editing errors and the predictable story line is the main drawback of the book. The author has very efficiently described how true love can exist even if she leaves him. I will recommend this books to those who are searching for a light read.